Frederik February 15, 2015 Comment? 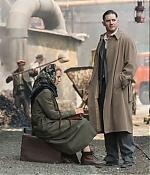 Some fantastic new production stills from “Child 44” have been added to the photo gallery. Many thanks to Marinka for sending them in. Click any of the previews below to see all latest added pictures.